The TIM3 MACHIN3: "Makes" More Time for You While Making Amazing Meals! It doesn't travel through time, but it does save you a ton of time in the kitchen. What can the TIM3 MACHIN3 do for you? Quickly and automatically cooks delicious rice– with no browning on the bottom! 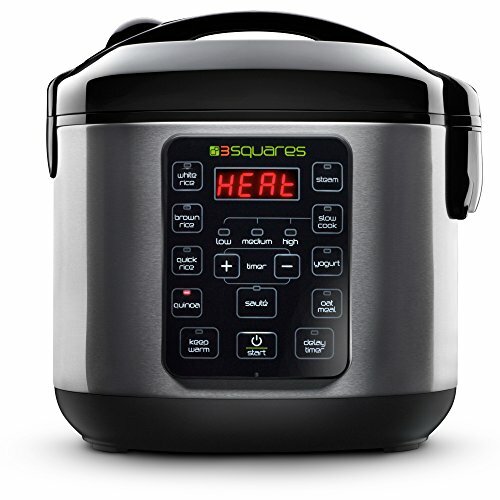 Slow cooks classic comfort foods with programmable settings that set 2 to 10 hours. Makes homemade yogurt in just a few simple steps: the TIM3 MACHIN3 does all the heavy lifting! Toasts then cooks quinoa automatically for incredible flavor. Prepares hot, hearty oatmeal breakfast ready in the morning. Steams healthy meat and vegetable dishes– even while cooking rice below at the same time! Sautés rice for Spanish rice or pilafs prior to cooking, stir frys veggies or even browns meat before slow cooking! Faster: cooks rice up to 45% faster than competing rice cookers! Smarter: Fuzzy Logic 2.0TM monitors temperature above and below the cooking pot and makes adjustments automatically. Built for quality: extra-thick cooking pot, more powerful heating element and smart digital display. If you have any questions about this product by 3 Squares, contact us by completing and submitting the form below. If you are looking for a specif part number, please include it with your message.